I ate my first soft-boiled egg as a student living in Vienna, after being coached that it was the polite thing to do. We were told that the Austrians didn't eat eggs for breakfast, but would probably provide them for us because they knew how much Americans liked them (though at the time I didn't much like eggs). Most mornings, our host mother soft-boiled a couple of eggs and set them into pretty little egg cups, which she served with fresh bread, butter, sliced meats, and jam. Now I make soft-boiled eggs with buttered toast for a simple breakfast, as well as pick-me-up when I'm hungry but too tired to cook. Place a small saucepan filled with water on the stove over medium-high heat. Once the water comes to a boil, carefully lower the egg into the pan. Set the timer for 6 minutes. Once the water returns to a boil, lower it to a steady simmer. Meanwhile, toast and butter the baguette slices. After 6 minutes, remove the egg from the water with a slotted spoon. Turn off the heat. Slice the top off the egg. 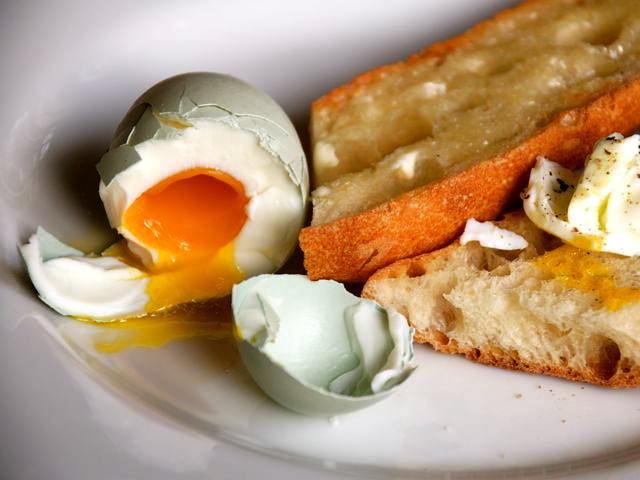 With a spoon, scoop out the egg onto the toast. Sprinkle with salt and top with a fresh grinding of black pepper.